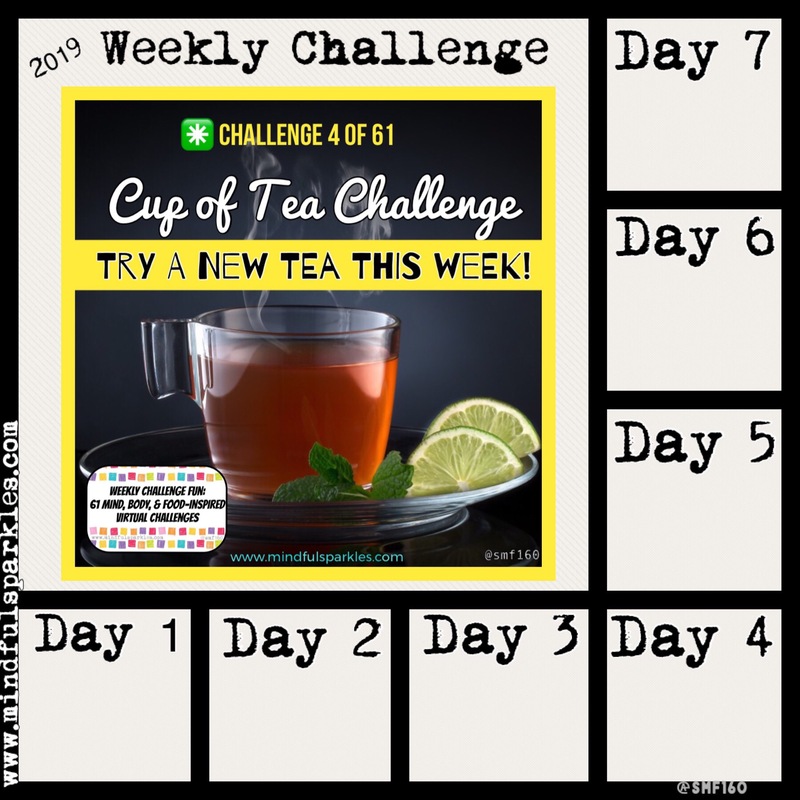 Cup of Tea Challenge – Weekly Challenge 4 of 61 – Try a new tea this week or drink more tea this week than last week. Because even if you are an avid and dedicated coffee drinker like me, drinking tea is another wonderful beverage to add to your daily choices, also I love the fact that for most teas, I do not need to add sugar or milk. This makes the tea a no-calorie / zero SmartPoint option for any time of the day. Tea is also an option almost everywhere you go! Airplanes, hotels, restaurants, friends’ homes, special events, and even some movie theaters (like AMC’s Dine-In theaters) have the option to get a hot cup of tea. Take this week to add a new tea or reacquaint yourself with you existing tea bags sitting in your pantry. Knowing how you like your tea can be another zero point deterrent in your personal tool box of weight loss strategies. Drink tea and then see if you are still hungry for that snack! You can even bring your own favorite teas with you on vacation or when you travel. Hot water is pretty much available everywhere. For previous posts on my travel tips, click here. Tea can give offer you a variety of flavor option depending on your cravings. Enjoy some a caffeinated version or a decaf option, so tea is great any time of the day. Liquids are important and although I wouldn’t count a cup of tea in my water intake for the day, it really helps to add in a different flavor to the beverage consumption part of my day. So, this week, try a cup of tea (iced or hot)….even if tea is not your normal cup! Drink the tea or teas. Consider tracking your likes and dislikes. Want to print out these instructions for the January challenges? Click here for a link to the January worksheet. ✳️ My current favorite teas? and several Stark Teas such as their Caffeine-free Peppermint. What are some of YOUR favorite teas? Please feel free to share in the comments. 📌Start the challenges on whatever day is best for you. 📌Original 61 Weekly Challenges 2019 post with the list of the challenges for the entire YEAR can be found this link. PS – The links are for convenience, I do not receive any compensation if you click through…just making it easier for you to find the products if you want to purchase them for yourself. PPS – If you get tired of tea, click here to see two of my previous Coffee Menu posts. Coffee will always be my first love, but I do enjoy tea as an additional beverage.